Getting the most from your Facebook page. Under current Facebook algorithms, an update you post on your Facebook page will be seen by approximately 5% of your fans if you do nothing more than post it. If the 5% that organically found your update liked or shared it, the percent of exposure will go up. That might be just fine for some of your posts. But what if you want to make sure you reach more of your fan base? What if you want to grow your audience on Facebook? Relying only on organic efforts isn't likely to make an impact in today's Facebook. You're going to need to consider boosting or more targeted advertising options. What is boosting a post? Facebook allows you to boost a post which means forcing it higher in your audience's News Feeds, increasing the likelihood that it will be seen. You can choose to boost a post to your fans or to friends of your fans. You can also choose for how long you'd like the post boosted. Learn more about the mechanics of boosting from Facebook's help section. The cost per click (CPC) is pretty affordable when boosting, but the question you really need to ask is if those clicks are coming from the right people. Look at the content of your post if the post is just about sharing information, e.g., announcing the grand opening of a new location. In this example, the CPC is likely of value. However, if the post is more about increasing engagement with your audience—such as getting them to visit your website and complete a form—then you might just want to take a step further and look at targeted posts. Getting 10,000 likes on a post can be a boost to your self-confidence but if 80% of those clicks are from people that don't meet your audience demographics, are they useful? Maybe not. That's where Facebook's targeted advertising options come into play. The cost is a little higher here but Facebook does give you options to advertise your page to specific demographics such as location, gender, age, interests and more via Facebook's power editor. To quote Facebook, "The best way to have your posts show in News Feed for the people who like your Page is to post things you think your audience will like, comment on, or share with their friends." Once again marketing comes down to knowing your audience. 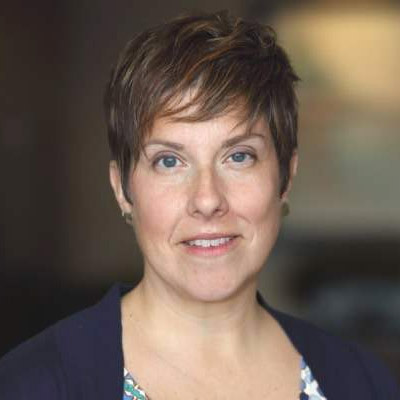 Boosting, targeting, promoting... it all boils down to the simple rule that if you want to connect and engage with your audience—in any media—you need to post things that matter to your audience. Here are a few examples from TBH clients who use our social media services. 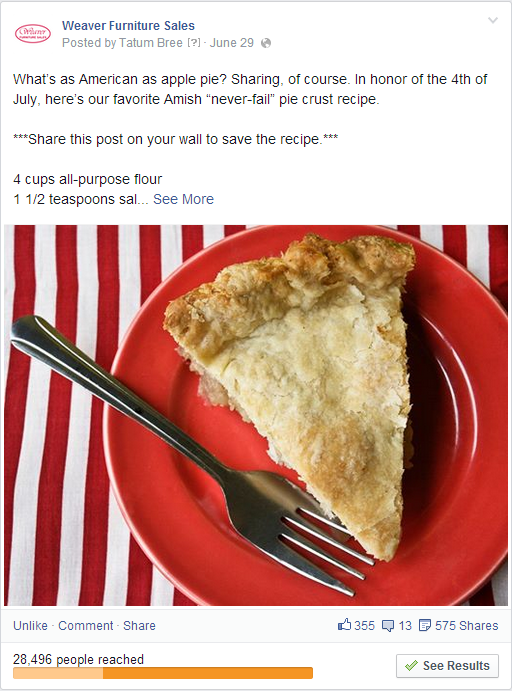 This pie crust recipe/sale promotion post did well because most of Weaver's fans are women with families, and the post appeared in conjunction with the 4th of July holiday and Weaver's holiday promotion. The post's content had reach that allowed it to connect with people who had not heard of Weaver Furniture Sales, but were concerned with nailing that perfect apple pie to celebrate the holiday. Since that audience matched up with Weaver's prime demographic, they were naturally interested to see more from Weaver, and the store gained a significant number of new followers as a result of the post. 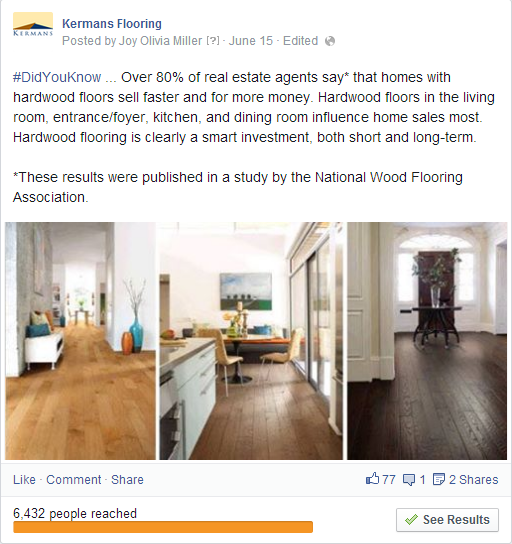 This hardwood flooring-themed post by Kermans used a combination of an attention-getting number with a trio of eye-catching photos to communicate the idea that an investment in new hardwood floors will pay off when home owners decide to sell. The post's content had reach that allowed it to connect with people who might not have heard of Kermans, but were interested in home improvement. Since this post reached a wide audience that matched with Kermans' target demographic, we noticed an uptick in "fans" of the Kermans Facebook page after this post with relevant information was shared and promoted. Want to learn more about how to get your Facebook posts seen? Are you ready to connect with your audience on Facebook, Twitter, Instagram, Pinterest, and other social media? TBH Creative can help you with your social media strategy and execution. Learn more about our Social Media Strategy Services and contact us to discuss how we can help you.